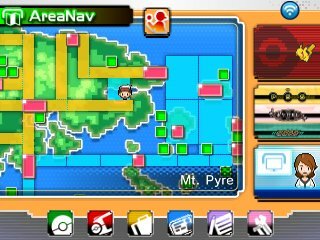 The AreaNav is a part of the PokéNav Plus which shows the map of the Hoenn Region. When you have selected it to be on the bottom screen, you will see your position ion the route in real time. This allows for you to not get lost easily in the water routes and allows you to make sure you know where you are going. However, there is more to the AreaNav than just this. 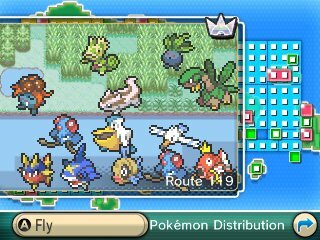 First, when you enter an area, on the bottom screen it will have an icon telling you if there's a trainer to rebattle, a Secret Base in the area, or berries that need picking. This part of the Area Nav ties in the the DexNav. 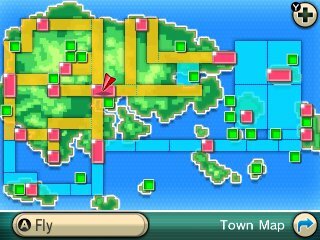 When you select a place in the map, it will bring up any Pokémon that are in the route. Ones that you have captured will appear on the screen and if you touch them, you can load up their Pokédex entry to see how many times you have encountered them and get details on them. Pokémon you have seen but not caught will appear as silhouettes. From here, you can also Fly directly to the route. The next part of the Area Nav is the most important for a trainer. 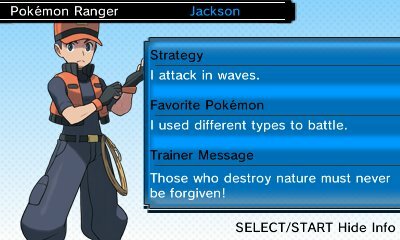 In this game, many of the trainers will offer rematches as you play through. 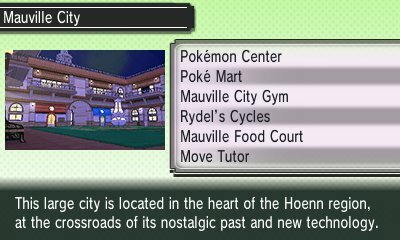 As such, when you select this part of the AreaNav, you will be able to check these specific trainers through the feature known as Trainer's Eye. This lets you know the teams of the opponent and whether or not they are ready to battle. 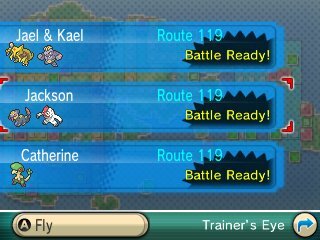 If an area has a trainer ready, the dots over the route are white, but if not, they are grey. This feature also showcases the Gym Leaders. From here, you can also Fly directly to the area. The next part of the Area Nav will highlight any route and area that has got a Secret Base in. 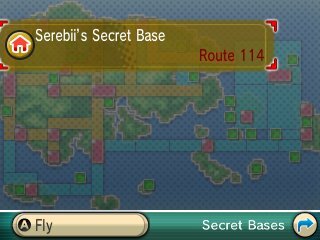 When you select the area, you will get a list of all the Secret Bases within it. The final part of the AreaNav showcases the berries you have growing. 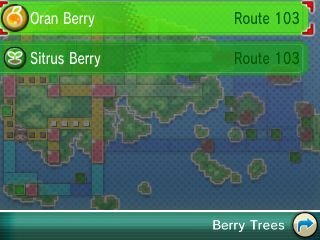 When you select a route, it'll tell you if you have any berries that are ready to be picked, or needing water. This allows for you to stay on top of things within the berry growing scheme and make sure your berries grow perfectly.